A cycle route in ʼs-Hertogenbosch leading to an industrial zone was not well-connected to the rest of the cycling network. To get from the normal cycle network to the start of this cycle way you had to know your way through a maze of residential back streets. It was okay to cycle there, but you really needed to know where you were going and the route was not optimised for cycling. 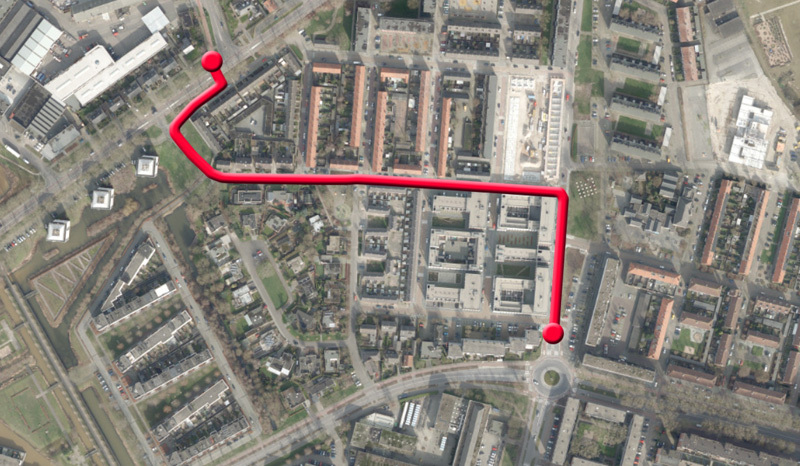 The route through the residential area to remedy the missing link in the cycling network. So the city chose the best route through that residential area and decided to change the ordinary streets into cycle streets. All the streets were already in a 30km per hour (18mph) zone, but motorists certainly did not always obey this limit. 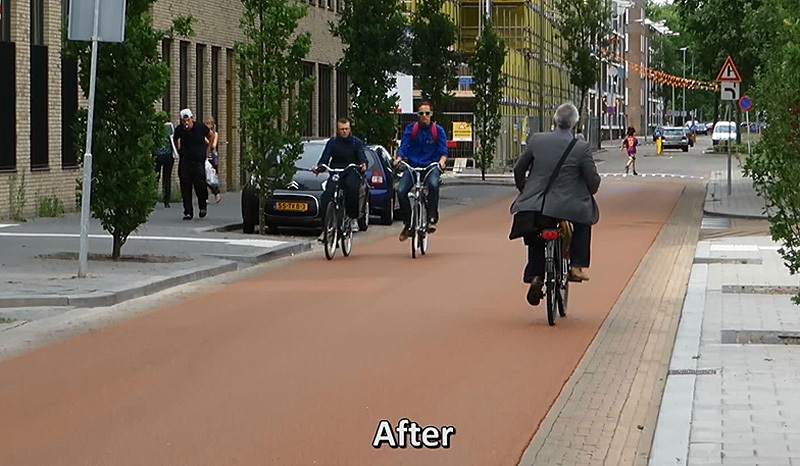 To make the streets better for cycling they were completely redesigned. Before that was done, and as is usual in the Netherlands, all sewerage pipes and other utilities under the street surface were first renewed. The street profile went from a standard street designed for motor traffic with black asphalt from kerb to kerb (curb), to one that is optimised for cycling. There is now a central ‘red carpet’ of smooth red asphalt. At either side of that red asphalt there are bands of bricks that optically narrow the streets even more, but that do give drivers the opportunity to go there with their cars, when they need to pass other drivers or people cycling. Priority also changed. It went from default priority, which means all traffic coming from the right had to get priority at every side street, to priority for traffic on the cycle street. That means people cycling can cycle continuously without having to stop so often. One of the residential streets before the reconstruction. The same street after the reconstruction looks a lot narrower and is optimised for cycling. At three locations the route takes a sharp turn. 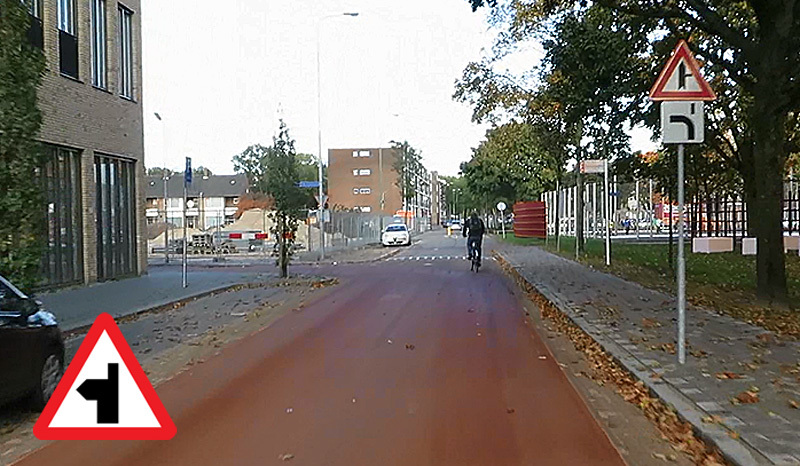 To make clear which direction the cycle route goes to, the red asphalt also makes that sharp turn. Signs were put up to designate the turn the continuous road. This makes what was considered straight-on before the reconstruction, now technically a turn. But in reality that still feels like going straight-on and even though these curves have been designed in a clear way, these particular spots are the few places where it does not feel so good. When you cycle to such a curve you can see cars coming towards you who will enter the cycle route, the drivers have to give way even though you turn in their path, but will they? That is always the question. Apparently most do, there have been no incidents reported and this cycle way has been there for over a year now, but it doesn’t really feel safe. It proves once again that what feels safe doesn’t have to be safe and the other way around. Anyone making what feels like a left turn goes straight and anyone who goes straight really makes a right turn. That is what the sign indicates, but it is not always understood. The (what I believe is the) English equivalent of this sign (inset) feels a bit more intuitive. There was one short-cut between two separate residential areas and to make sure it could only be used for cycling there was an old-fashioned solution with a chicane and horrible barriers. That short-cut has been widened and the cycle route now continues straight-on. At first the city had experimented to have this short-cut without bollards. Bollards are only there to keep cars out and they are dangerous to people cycling. In the choice between two evils, municipalities sometimes chose to accept the fact that every now and then one car will use the cycle way because that can be safer than having these dangerous bollards all the time. But in this case, in this particular neighbourhood, the route was used so often by motorists that the bollards really had to come back. Where the chicane once was there is now a continuous cycle route. Here the bollards were down, but they had to be put up again because many motorists used this short-cut. All the downsides to this treatment have to do with the behaviour of motorists. They still speed and they do not give the turning cyclists priority where they think they go straight-on. You will also see cars in the middle of the red asphalt where they are supposed to be on the brick band to the side. They then pass you very closely. Interestingly enough the city chose not to use the new signs for a cycle street, the ones that say “cars are guests”, something which most other municipalities do. But the sign is not in the law yet and ʼs-Hertogenbosch seems to not use it for that reason. I do think it would make the status of the street clearer than it is now. Cycle streets are so new that most motorists have not dealt with them when they learned how to drive. My video with background information about this cycle route. After about a year I do think the pluses outweigh the minuses on this particular route. It is a joy to cycle on the smooth red asphalt and you cannot get lost so easily if you do not know the area very well. That it can be too crowded on the route with just a few cars is especially annoying in rush hours when many school children use this route. But apparently the speeds are low enough for last second adjustments in behaviour. No real crashes have been reported since the reconstruction. So all in all this route upgrade should be considered an improvement. A before and after side by side of the entire route. The return ride in the new situation only. I understand the need for bollards, but it would be better if they were made retractable so that emergency vehicles can still use the shortcut. I remember you took me on a tour of most or all of this route, especially the two sharp turns featured in the first part of the video (before you switch to pointing out the negative consequences of the new design). This is the part where I believe you said Lei had issues. Does he still hold the same opinion or does he agree this is an improvement? That left-turn/straight may benefit from a necking or divider on the straight-through route – it is usually a good visual cue for ‘intersection is here’. It might be good to have a small raised but not difficult to go over section of grey tiles marking the middle of the road, and it continuing through curves and junctions. It would be a bit like the centre line. It reinforces who goes first and where the route is. It struck me that the loudest noises on the video of the new treatment are the voices of local children calling out and/or playing. A reminder of who also benefits a great deal from effective traffic-taming measures that make cycling the prioritised mode of transport for through traffic. I usually try to see how the bicycling infrastructure shown in the videos on this website can apply to the city of Los Angeles. Major differences are that LA does not spend nearly as much on roadway or bikeway construction or maintenance per capita as do Dutch cities and the space that can be obtained for bikeways on major streets are not usually connected due to the flow of motor vehicle traffic having the priority. Los Angeles does have the advantage of buses having bike racks on the front and the transit trains allow bicycles on-board during peak commute hours. New transit rail lines being built is enticing people to use a bicycle to connect to them. The 10 CicLAvia events that LA has had since October of 2010 in different areas of the city have always been close to the transit rail lines. This enables people to haul their bicycles to the event on a train, thereby giving them an opportunity to try riding to and from a transit train station on a bicycle. Making a route for bicycling on a residential street by applying color to the asphalt on the entire street I thought had possibilities in LA. The city does have its own asphalt plant and they do apply a slurry seal on residential streets as part of its maintenance. There are several different colors used on roads or parking lots to designate a specific purpose in the U.S.A. Blue is used for handicap parking spaces. Red is for bus lanes and green is for bicycle lanes. Some problems are that slurry seal is not currently applied in a pattern that you could make a route in a reasonable time frame, the extra cost of the coloring and what the color would mean for drivers. Green would mean that cars cannot travel in the lanes because they are bike lanes. Portland came up with a clever way to designate bicycle route on residential streets by the use of sharrows. 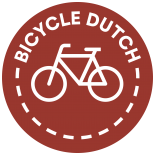 This symbol was invented to indicate where bicyclists should ride in mixed traffic on a busy street in order to avoid getting hit by a parked car door. Portland applies it to the middle of a intersection of residential streets to indicate which directions you can take to continue of a bike route and also points the chevron part in the direction you need to turn to continue on the route. Although I do agree with you, Mark, that sharrows on major streets is pretty much just useless paint, it does seem to be a benefit as a directional tool on residential streets. Los Angeles applied sharrows on some residential streets in the Hollywood area in the last two years where traffic is too heavy to put in bike lanes. The 2013 bicycle count done by the Los Angeles County Bicycle Coalition had an average bicycling increase of 22% where sharrows were applied compared to regular streets. Sharrows also are reflective, which makes them standout on the many unlit residential streets. Colored asphalt would be much more difficult to see in this situation. I know that you always strive for the best solution in regard of feeled safety, as this is what get’s people on the bike. Which means infrastructure as seperated as possible. But I think that a well done solution of mixed traffic can softly and slowly change also the percepted safety. Cyclists learn “Hey, I will not die immediately if a car is around me, and it works” and motorists learn: “OK, sometimes I have to share the street with cyclists, and it works”. Not to say that it should be always like this, but I think sometimes some learning to share instead to seperate in a little area is totally ok.
Nicely done, thanks for the interesting post as always. Most residential streets in The Netherlands are shared. But that only works because they’re 30km/h zones, and through traffic by car is discouraged or made impossible, so volumes are low. 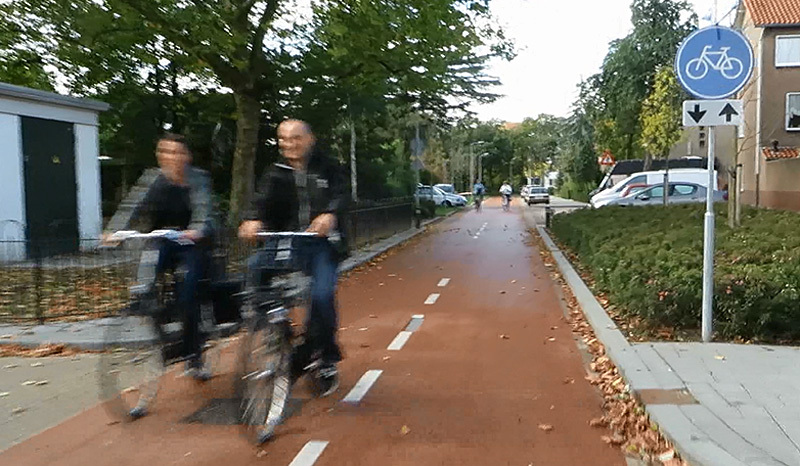 I guess that only about 10% of dutch roads have cycle facilities, but on a normal route from A to B, you would be sharing the road only on the first and last 5% of your trip. And when I created a model for how my district in my own city could have things like cycle lanes, cycle paths, 30 km/h shared roads, and shortcuts, I found that the route from my home to my sister’s school means that she would be cycling on just 200 metres of shared road and 1.6 km on cycle paths away from cars, and that she would never have to yield the right of way to a car, and she would never stop for a traffic light or for a stop sign. And cars would have to take a much longer route, 5.2 km journey, almost all of it on arterial roads. My sister if she cycled, would never be next to an arterial road, and she crosses just one of them, on a bicycle roundabout like Zwolle now has. Oh, and that removal of chicanes: They are still not all gone. There are still some terrible ones in the cyclepath along the Aa, south of Hintham. 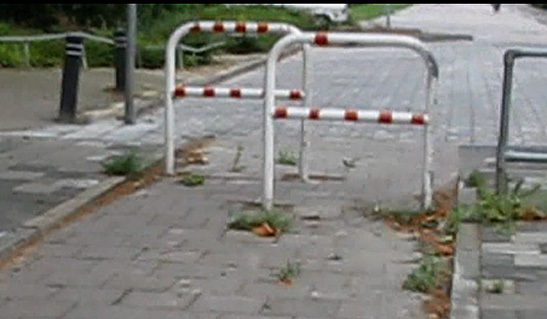 ‘s-Hertogenbosch has a lot of cyclestreets, none of them having a sign (neither the standard one nor any own creation). Just red asphalt, sometimes not even that (but things like a raised center making overtaking, and in particular close overtaking, unattractive). I also noticed there’s a large difference in quality between them. The one near the station, connecting to the Stationstunnel from the North, is a perversion of the idea with its high amount of cars and buses. The new one along the Parallelweg is the opposite – a cycleway in the best Dutch standard, with one-way car traffic allowed. Hi, Warwick Marshall from Cycle Action Paeroa, New Zealand. My question is: What is your posted cycling speed within a city or town. I.e legal speed. Does this differ when riding in the country? There are no speed limits for cyclists in the Netherlands (apart from the general ‘one should not act in such a way as to endanger traffic’). The reasoning behind this, if I recall correctly, is that there is no obligation for cyclist to have speed measurement equipment, so cyclists should not be forced to have strict speed limits either. For mopeds when they are on the cyclepath, the speed limit is 30 km/h in cities (or towns or villages), 40 km/h in the countryside. Thank you for your reply. In our town of Paeroa we do not have use to separate cycle lanes but share with motor cars who travel at 50km/hr in a very tight urban main shopping street. This causes distress to the cyclist. This being the reason many people refuse to commute to the shops as when the distance for local residents being under 5.0km, with a population of approx 3500. I’ve looked at map and streetview for Paeroa, and I would not describe this street as ‘tight’, but it is indeed awful in all other aspects. From a Dutch perspective, combining a major through road for cars with a main shopping street is a strange thing to do. We would probably divert the road around town, but if that’s not feasible choose a different layout, with the parking spaces either reachable only from parallel roads (30 km/h) to be created or completely moved to the back side of the shops. Thanks for replying. The Local Council in Paeroa with ratepayers voicing their concerns regarding heavey truck movement wanted a new route to be put in place. This would be at great expence to the ratepayers….I would certainly like to see exactly that….a diverson for heavey articulated vehicular traffic. At the Northern end of Paeroa on approach from Auckland end is very tight for commuters this moves into the middle of town. Once past the RSA it has favourable cycling access and road width, but without intersections like your type. Paeroa is very lucky in the fact that all roads leading into Paeroa, plus local streets have wide enough space. The trick is to get everyone back onto their bikes….winter….they all feel the cold. I thought it’d be helpful to add that, generally, most dutch people have low-geared bikes, like 1 and 3 speeds (they aren’t road racers riding 21-speed bikes in the city), so naturally, there isn’t a need for cyclists to be restricted to a certain speed limits like car drivers because they aren’t cyling in a fast, reckless, dangerous manner. Thanks for the reply. I ride slowly around town, in which I take in the scenery of birds, people. In Paeroa we are lucky to have around the outskirts of the central part of the town ample space for commuter cycling. It was normal years ago for the school children to ride to school, this was helped by Transport initiatives of teaching kids to ride in traffic. But with a mixture of heavey articulated vehicles through our town. coupled with cars it’s become too dangerous to ride your bike in certain parts of the towns Main Street. This is a shame. There appears a calming peaceful attitude to your overal transport infrastructure, no one seems too be in a rush…unlike our counterparts in New Zealand…Rush Rush Rush…Impatient…too lazy to leave the car at home and walk or ride to the shops or too work, saving them money in gas, cost of vehicle. Let’s say…under 6 km or less to the shops for our local Resisdents….My only hope that the council will put aside funding to widen parts of the street. This will put our town at the very fore-front in leading the rest of New Zealand, Australia in becoming truly a cycle friendly orientated town. Thank you for the message. Your country is a blessing for other countries like New Zealand to follow and learn from. 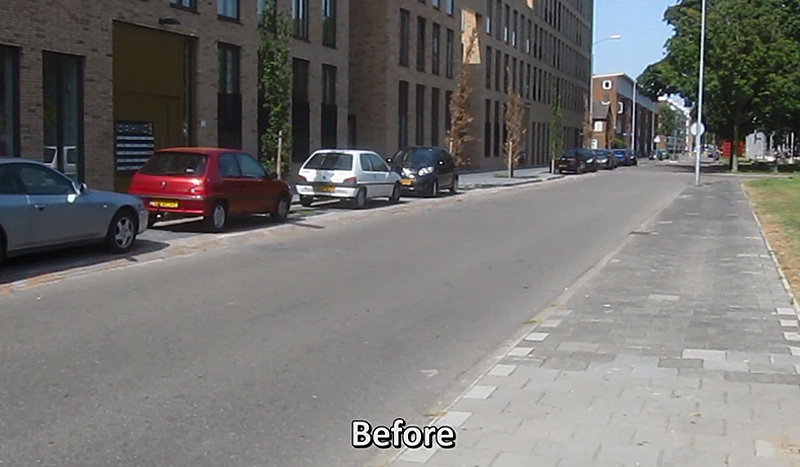 This entry was posted on 24 July 2014 by Bicycle Dutch in Original posts and tagged ’s-Hertogenbosch (Den Bosch), before and after, cycle streets (Fietsstraat).